l 	Q. You taped it to his window? 2 	A. Over the posters that he had out. 3 	Q. Why did you tape -- what is that letter consist of? 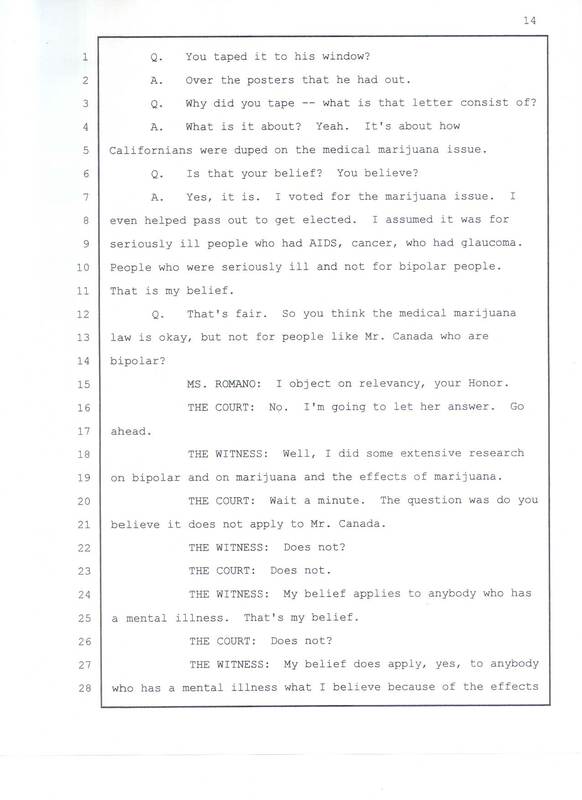 5  Californians were duped on the medical marijuana issue. 6 	Q. Is that your belief? You believe? 9 seriously ill people who had AIDS, cancer, who had glaucoma. 10 People who were seriously ill and not for bipolar people. 11 That is my belief. 15 		MS. ROMANO: I object on relevancy, your Honor. 19 on bipolar and on marijuana and the effects of marijuana. 21 believe it does not apply to Mr. Canada. 22 		THE WITNESS: Does not? 23 		THE COURT: Does not. 25 a mental illness. That's my belief. 26 		THE COURT: Does not?